From Kishi scion to Yoshida scion: with less than a week until the LDP presidential election, it seems hard to conceive at this point how anyone will be able to stop Aso Taro, professed manga lover and friend of otaku (oh, and longtime foreign minister and current LDP secretary-general). With Mr. Koizumi declaring that he will not cave to the "Draft Koizumi" movement that his "children" (including Koike Yuriko) have formed, Mr. Aso is the only henjin in sight, and after the bland pleasantries of Abe "beautiful country" Shinzo, a henjin just might be what the party is looking for. Sure, he has a history of inappropriate remarks — documented here — but it's all part of his henjin charm. With less than a week, he seems well placed to rally factions to his side and stifle a dark-horse candidacy before it emerges. He probably has nothing to worry about from prospective challengers at this point, including Tanigaki Sadakazu, who has been campaigning since day he lost the last LDP president election, and Fukuda Yasuo, the longest-serving chief cabinet secretary ever. It is still unclear whether Mr. Fukuda actually wants to run, and Mr. Tanigaki, now described as being in the LDP's "anti-mainstream," has little or no chance of garnering the kind of support needed to overcome Mr. Aso, who is likely to receive the support of the Machimura faction (the LDP's largest, and Mr. Abe's own). In the midst of all the maneuvering in Tokyo, it might be the LDP's beleaguered prefectural chapters that call the shots, seeing as how they absorbed July's blow as much as the national party. According to Asahi, they have reacted to Mr. Abe's resignation with "surprise and anger," and in the aftermath of the resignation, fifteen prefectural chapters from across the country have apparently begun considering throwing their support to Mr. Aso, just shy of a third of the total forty-seven. With one day before campaigning officially begins, it may be Mr. Aso's race to lose. Not that he'll be winning a desirable prize. 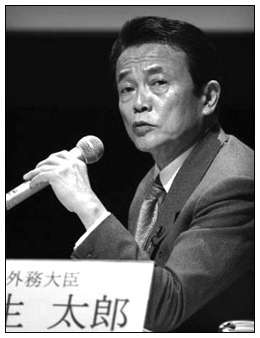 While stepping into the shoes of a prime minister who will leave office with a 74% unfavorable rating means that there is more or less nowhere to go but up, Mr. Aso will have to rebuild the LDP from the regions up, while fending off the DPJ in Tokyo.